2019 will be a lower than average year for the Rooster. You will have to be extra careful this year due to several ominous stars associated with heightened risk of accidents and injuries. With only two lucky stars that are not very influential, you will be very weak. Career is unsatisfactory and financial losses are indicated, therefore stay out of high risk investments. First and foremost, Wen Chang star (Intelligence) will be favorable for scholarly pursuits and examinations, most likely to benefit those born in 2005. It may not be useful for monkeys born in other years unless you work in literary, administrative and creative fields such as designers, artists, musicians, writers and admin staffs. Next, you have the lucky Ba Zuo star (Eight Seats) that will increase your social status level and unexpected likelihood of success due to helpful people from time to time. However, it does not mean you are getting the luck of promotion. This star favors those who are in the field of research, development, information and learning arena. Students will benefit significantly from this star. It is not going to be that useful for those who are in sales, marketing and business. You will need to capitalize on unexpected chances given by your superior if you like to see a successful end. Mainstream income is stable, but you can forget about the luck of gambling. You will most probably overspend and run into financial problem. On the downside, the harmful Di Sha star (Solid Killing) has the duty to rip you off your belongings. You will be vulnerable to wealth leak, potential theft and robbery. You are therefore most likely to lose your important personal belongings such as your smart phone, wallet and items of significant importance. Be mindful and behave wisely because the inauspicious Po Sui star (Broken) may cause damage in reputation and loss of trust by your boss or peers. To make matters worse, the lurking of the gossipy Qiu Yu star (Enslave) warns of many disputes, troubles and lawsuits coming your way. This star also threatens imprisonment if you have broken any law. Safety wise, the dangerous Zai Sha star (Calamity Sha) indicates bloodshed, cut and injuries due to accidents. It is a warning against danger during overseas trip. Under the influence of this star, your personal safety will be undermined. Next, the very unlucky Tian Gou star (Sky Dog) charge in strongly to bring bloodshed, petty characters, financial losses and gossips. This is one of the most feared trouble bringing stars. You are likely to face legal problems. Its presence also indicate that you should avoid attending any funeral by all means. Do not neglect this warning! If there is anything less positive at all to be anticipated, it is the result of another pesky Diao Ke star (Suspended Guest) that denotes health problems among elderly members of the family. Give more care to the health of the elderly at all times. To sum up, it will be a trying year in your career with financial losses and tumultuous relationships indicated. Health wise, you will need to pay more attention to your food intake. You are advised against attending funerals or visiting the sick in the hospital if possible, else misfortune will strike upon you. In terms of love luck, there is hardly any progress due to weak peach blossom. Activate Achievement Star #1 and Career Enhancement - Display the Dragon Tortoise Globe at your work desk or in the west of your living room. Carry along the Emperor's Robe Amulet in your work bag. 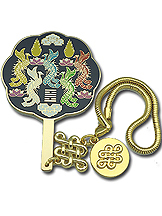 Attract Wealth and Prevent Financial Losses - Wear the Pregnant Dragon Pendant and display the Treasure Shi Shi Ruyi in the west to enable savings. Neutralize Trouble makers/Disputes - Carry along the Chundi's Fan-Mirror. Anti-Accidents/Injuries - Spin the Prayer Wheel regularly. Display in your car or carry along the 8 Immortals Coin. Activate Love - Display the Nine Tailed Fox Amulet in the north.